The choice of a lot of our food plants show the European influence on Australia and they may have been chosen from our cultural background rather than for our climate. One group of plants that may not get the recognition they deserve are members of the cacti family. Hardy, often strikingly ornamental, at times useful and productive and with some of the lowest maintenance needs, cacti collections should be used far more by people trying to attain greater self reliance. They are possibly one of the least appreciated group of useful plants by us Australians, and quite likely many cactus growers don't even fully appreciate their useful values. Plants grown for their ornamental value in Australia could be the same ones grown for fruit in their homeland. Perhaps we should first look at what was historically Australia's worst weed, the prickly pear which caused havoc in parts of Qld and NSW, and appears to have given cacti bad press generally. A number of species of Opuntia have been called "Prickly Pear" and two of these are proclaimed as noxious weeds, Erect Prickly Pear O. stricta) and Drooping Prickly Pear, the main culprit. In addition, the Wheel Cactus, O. robusta is also a noxious weed. Drooping Prickly Pear, also known as the Desert Rose because of its beautiful flowers was brought to Australia for a number of reasons, a host for the cochineal beetle (which is used to produce a red dye), for fruit, stock feed and as an ornamental plant. It took over large areas of southern Queensland and northern NSW forming a dense prickly impenetrable mass varying from 1-2m high. It made farms totally unworkable, at times people not even able to get on to their own property. Every attempt to eradicate it failed until 1925 when 2,750 eggs of Cactoblastis cactorum, a moth whose larvae bores into the plant were introduced from Argentina. Large scale breeding took place and over 2,000,000 eggs were sent out to farmers free of charge (ref 2). The insects were extremely successful in controlling the prickly pear in the hot dry parts, however they were unsuccessful in some parts NSW where the cactus grew from the ocean to the snowline. Prickly pear may have taken over land mostly affected by over grazing, and when the cactoblastus destroyed it, the land was most probably more fertile than before it grew there. Figures of 500- 800 tons of cactus per acre have been given, a heavy wheat crop may only contain about 15 tones per acre of vegetable matter. Different experiences have shown how different cultures have had different responses to the same plant species (ref 1). In 1768, French colonist, Count de Modave refounded a French Settlement at Port Dauphin on the south east coast of Madagascar. 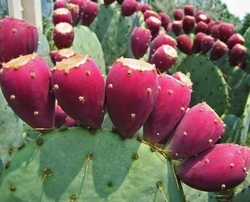 He introduced prickly pear to grow as a barrier to protect his fort. However the locals were still able to overthrow him and the prickly pear spread. When the French returned in 1900 to recapture the area, prickly pear was a major part of the local ecology and economy, the local people using it as a living fence to contain their zebu. The fruit was eaten and the pads were a source of drinking water and with the spines burned off, a source of food for the zebu. The whole landscape was like a maze of prickly pear and the French troops would find their paths blocked with a heap of prickly cactus and before they could remove it they were caught in a rain of spears from over the hedge. In 1925 the French returned with cochineal beetles and by 1928 the beetles had a strong hold. Within a few years the prickly pear had nearly disappeared. This caused a massive famine in 1931 and the French then took control. Prickly pears are growing in a number of locations in Victoria and don't seem to be the weed threat that they once were in the hotter, drier parts of Australia. However they shouldn't be allowed to grow unmanaged anywhere in Australia because of their weed potential. The importation of other species in the genus Opuntia as well as Cereus has been severely restricted to Australia as a result of the experience with prickly pear. With the spines removed, the young pads come up really well in stir fries (and it's worth growing for this reason alone) and the fruit is tolerably edible, cut it in half and spoon out the pulp. Its main value to us being that it would provide fruit when there is little else through winter and spring. Seeds of the prickly pear and Indian Fig can be ground to make a nutritious flour that can be used to make a thick broth (ref 1). Originally from Tropical America, it has been cultivated and naturalised in many countries throughout the world. Probably the most widely cultivated cactus in Australia. This is because of its excellent flavoured fruit. It fruits into winter when there is less variety of fresh fruit about. Fruits are occasionally available for sale in the fruit shops. var. alba. Fruits large, oval, white or white faintly streaked yellow or reddish. var. rubra. Fruits oval or somewhat elongated and peduncled, crimson red. var. lutea. Fruits oval, yellow, the sweetest. var. asperma. Fruit oval, yellow. var. pyriformis. Fruit, pear shaped and peduncled, large, 12 cm long or more, yellow streaked or reddish violet. Pulp nankeen yellow, few seeds. A selection of O. ficus indica that developed by Luther Burbank as a stock feed for the dryer parts of America. Near enough to spine free, its pads are used for stock feed, particularly in drought when the water content could also be a benefit. The pads of Indian Fig can also be used as a stock feed, as can the pads of the prickly pear if the spines are burnt off. Some of the Opuntias would be good for a living and productive fence, some members of the genus Cereus would also be good for this. These grow to perhaps 10m high with round spiny stems from 15-25cm thick. Some produce delicious egg shaped, egg sized pinky orange smooth skinned fruit (totally free of prickles) perhaps from June to October. They may need a pollinator but are well worth growing for their fruit. We are keen to get more info. Large round columns growing to perhaps 15m with excellent flavoured prickle free fruit, eat the skin and all. Fruit ripen from June to Oct, depending on location and variety, needs a pollinator. Also known as Dragon Fruit these Hylocereus species have large, attractive delicious fruit. They are climbing cacti that are tolerant of shade but fruit better in open sun. They are only moderately frost tolerant. Daley's Nursery in Kyogle have red fruited Hylocereus undatus and H. polyrhizus for sale and also the yellow fruited variety of Selenicereus megalanthus. Both the red and yellow fruited Dragon Fruits have a very pleasant, mildly sweet flavour, the yellow being slightly sweeter. They fruit sporadically if planted independantly with significant increase in production if more than one variety is planted to allow for cross pollination. Most cacti varieties are very easy to grow, break off a pad, leave it a few weeks in a well ventilated dry place to calouse then plant it. Avoid poorly drained soil. Andrew, from Diggers Seeds passed on his way of getting more plants started with a limited number of pads. He cut the pads of the opuntias into sections and left them until they had caloused, each section was then planted in pots. Suggest you cut the sections from top of the pad down and mark the top with an arrow up. Plant with the arrow pointing up. Because of the hardiness of many of the cacti varieties it isn't often expected that they would respond to water and fertility like they do. The fruiting varieties of cacti we are growing grow much quicker and I expect will be more productive with mulching and regular watering in the hotter months. The Cactus Society of S.A. Inc. Make contact through the internet- cactussa.ozy.net.au People selling cacti, including some useful varieties. 6. "Noxious weeds of Victoria" W T Parsons. Appreciation/acknowledgment- Joylene Sutherland, Gavin Hart, Ian Hay.